Okay, that’s a stretch. But, you get what you pay for, right? So, first — sorry that I haven’t updated you on anything since we got home. There’s some stuff I should have said, but mostly it’s “things are getting back to normal (normal, plus meds and a lot of blood tests) and he’s doing fine!” Still, I should have. I will try to get better about that. But here’s something else. That bruit that caused all the hassle just before we left is the subject of our focus right now (see this post and then this post about the term for reference). So after the doctors and surgeons at OHSU decide that it’s nothing to worry about (but we should get another ultrasound to verify that soon), we bring it up with our home-base nephrologist. She’s game to do the ultrasound, but isn’t sure she hears anything initially. A week later, she hears what all the fuss was about herself — apparently Machen’s bruit isn’t where she expected to find it, but once she did, she wasn’t just game for getting the ultrasound, she worked to get it done quickly. That happened this past week, and there are two notable places where the blood velocity changes around the kidney — one in an artery, one in a vein. This is what the bruit was pointing us to. Stenosis. Which is to say, that the artery affected is narrowing before it reaches the kidney. Renal Artery Stenosis causes blood pressure to rise — not a good thing in anyone, a very bad thing for transplant recipients. Machen’s been dealing with high blood pressure since the transplant (not uncommon), and has even noticed this BP rising after increasing his medication for it. Long-term, this can lead to kidney failure. As you can expect, those last two words kinda freak us out. So, what are we going to do? Well first off — we’re not panicking. We’re not getting excited. We’re not afraid. We are very aware and are working on getting some answers. Secondly, we’re waiting for the transplant surgeons at OHSU to weigh in on this. This is their bailiwick, it’s going to be them in the driver’s seat for treatment. Our nephrologist is consulting with the kidney specialists at OHSU, but says that this isn’t a medical treatment issue. No medication will help, it’ll be surgery. And since our local hospital doesn’t have transplant surgeons, we’ll be headed back to Portland for this. IF they decide that this is something that needs intervention. Thirdly, and this is mostly what we’re doing — is trying to be patient. We got the word about this on Thursday (Dr. Bender got the results Wednesday and started the ball rolling). As of this writing, we haven’t heard anything yet. Patience is hard. Machen’s feeling fine — he’s in no pain because of it, doesn’t feel this at all. We only know about this because of stethoscopes and ultrasound tests with doppler readings. He’s feeling fine, is in good spirits and is eating like a 14 year-old boy (which is its own brand of trouble, don’t get me wrong, but parents of 14 year-olds all over know this trouble). That’s all that I know right now. We’ll update the blog within hours of news — and maybe have a post or two about the good stuff going on, too. Author HCNewtonPosted on September 14, 2018 Categories medical stuffTags medical stuff, updatesLeave a comment on Trouble Bruit-ing? Last Friday, I described the unexpected delay in our return home. In between the time when the nephrologist and radiologist had found something and the time when they decided how much of a thing it was that they found, I mentioned that I’d received a phone call, and said the timing “was absolutely the right time and a very pleasant distraction.” Then I promised to tell you the full story when it was complete — I’ve put that off for a few days, hoping to get some better photos than the ones I’ll be using. But those haven’t shown up yet, and I want to post this while it’s still fresh-ish. Earlier in the week while waiting for something in the lobby area for the Ronald McDonald House, I’d seen an advertisement for something called, Dream Drives for Kids. 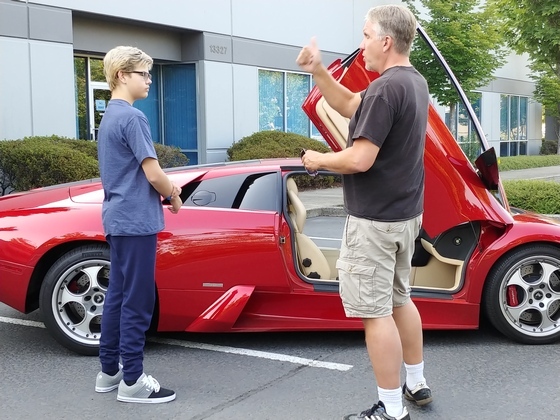 It’s this non-profit that “provides sick and medically fragile children access to amazing exotic cars for an hour-long experience we hope they won’t soon forget. Our goal is to create joy by taking the focus off of doctors and disease … and putting it on Ferraris, Lamborghinis, Porsches, Mercedes, and more through a two-hour, fully interactive sports car experience!” I went back to the room, forgot about whatever it was I was supposed to be talking about and told Machen about this — naturally he was interested, so we called and left a voicemail which led to the aforementioned call. Before I continue — isn’t that just the coolest idea? It’s also a nice justification for someone to indulge in car collecting — I say that without cynicism. Hey, if I had the means to collect cars, I’m not sure I’d be nice enough to do this. But really, when you have a medically fragile or sick kid, so much of their life can be wrapped up in their condition — giving them any kind of a break is a pretty great thing. This? Well, it’s just all kinds of great. Now, they’re in the middle of a move — which sounds pretty complicated (I think moving books is difficult, books you can put in stacks). So Machen didn’t get the full experience — no tour, for example — he got plenty, though. 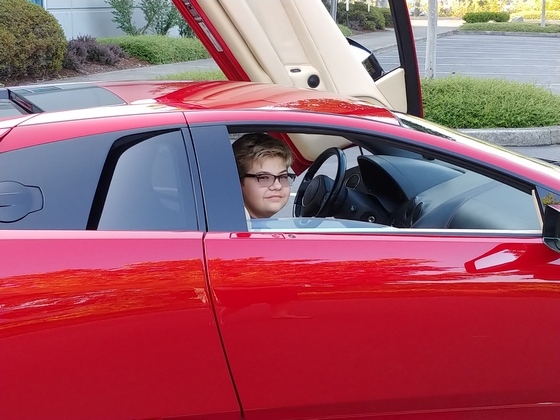 After a brief discussion with them on the phone, Machen selected a Lamborghini to ride around in, a 2002 Lamborghini Murciélago to be specific. Sure just saying “a ride in a Lamborghini” is pretty impressive, but when you can say “a 2002 Lamborghini Murciélago,” it’s much better. It’s in the details, no? We make arrangements and meet up with them (I don’t see their names anywhere on their sites, so I’m not going to name them). They are about the friendliest people we met in Portland (which is saying something — 94% of the people we met in Portland were tremendously friendly), They took some photos of Machen and the car, talked to him about the car and one of the scandals associated with that particular model (apparently, many Lamborghini stories involve some sort of scandal), some of the features it has, etc. Then he started it up. Sorry for the annoying beep at the beginning, I cut most of it out Note the contrast between the plane taking off nearby to the engine starting. Am told (wouldn’t know…) it’s about as loud inside. My wife’s video looked better, but the sound on mine is better — and I don’t move the camera around during this (sure, she blames the wasp that crawled into her sandal and stung the bottom of her foot, but whatever). Naturally, after the starting of the car, came the driving of the car — I’m not sure what all they talked about on their drive — the car, obviously; Machen’s health, school and whatnot. 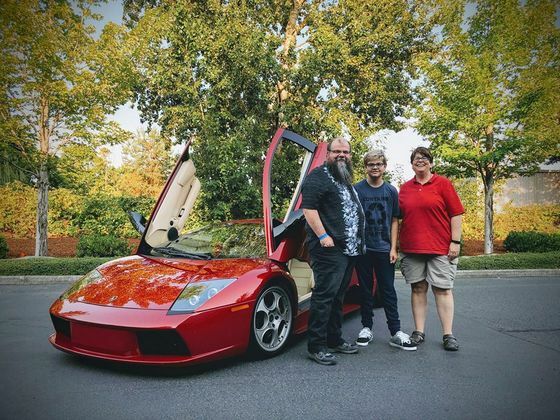 We followed along with the family of the driver — in nothing fancy, but very comfortable, and watched the Lamborghini in action (by the way, it was still pretty loud even when there was a car in between us. Not loud in an annoying way, just a not-so-gentle reminder that an engine more powerful than yours is nearby). I’m not a car guy at all — this is not news to anyone who’s spent more than 14 minutes talking to me (less than that if the topic is automobiles). But it is impossible to stand near this and not become one temporarily. It’s tantamount to standing next to the original The Starry Night and shrugging. 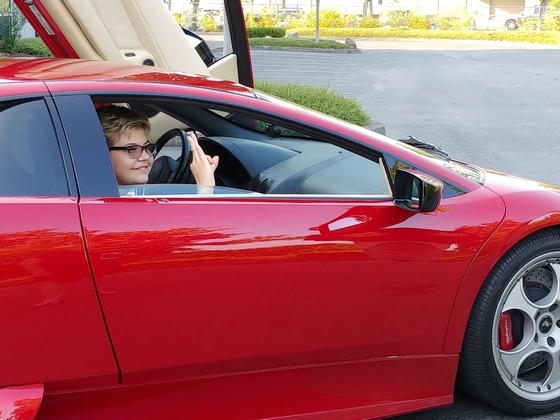 It’s really a fantastic machine, and it’s no wonder that my son, the aspiring car guy — smiles like this while sitting inside. It was a great experience all around — definitely the most enjoyable experience Machen had while in Portland (not saying that he’s not grateful for the kidney, not thankful for the care or anything like that — but on the whole, it wasn’t a fun time for him). But this? Dream Drives took his mind off of everything for a while and let him experience some joy. Here’s a couple of other pictures — when we get the others (taken by someone who knows what to do with a camera, and not just a couple of parents with cell phones), we’ll share some of them. I think she got some good shots. Okay, we’ve been given the proverbial Green Light (not the one from The Great Gatsby, the other one) to go home. We will have to keep an eye on the potential bruit and there’ll probably be an ultrasound in a month, and who knows what from there. I’m feeling more secure about that now and the likelihood that everything is fine than I was Friday after the details we were given. Then he’ll have a kidney biopsy around the 3-month mark — it sounds like that’ll happen in Boise. And . . . well, we’re a little murky as to what happens after that, actually. But first, a little drive across Oregon, greeting our dog (who is elderly, and I hope her heart survives the joy at seeing my wife — she’ll be happy to see Machen and I, too — but it won’t be a health risk) and our other kids (priorities). Then we have a few things to take care of — getting the Lab here used to our new protocols and testing, meeting with the local nephrologist and setting up a new schedule with her (no more of this every 6-8 weeks nonsense for awhile — we’re guessing, anyway), meeting with some people from the school to get him going there. Here’s the best part — Machen in particular has to be looking forward to this. We will spend some time in separate rooms. Maybe even out of earshot of each other. Since July 17, with the exception of his surgery (pre-op and post-op, too) and a few hours last weekend when my mother, sister, niece and oldest son pinch hit for us, Machen has had one or both of his parents within a few feet of him 24/7. Generally, the same room/vehicle. Can you imagine spending a month and change like that when you were 14? Somehow, we haven’t gotten on each other’s nerves too much, which is fantastic, but I think all three of us wouldn’t mind a little time on our own. Once we’ve enjoyed a change of scenery, gotten the ducks in a row for the next couple of months of recovery, etc. Then the three of us will work on rejoining our regularly scheduled lives, already in progress. Thank you all for reading, for your support, for your talking to us via social media, emails and otherwise — about our time here and your lives (it’s nice not to think about transplant stuff all the time). We’re not done posting here or anything — I just wanted to be sure to say it while we change gears. Bruit: A sound heard over an artery or vascular channel, reflecting turbulence of flow. Most commonly, a bruit is caused by abnormal narrowing of an artery. So, for the last week to week-and-a-half, I fully expected that today I’d be posting something about how we’ve been sent home where we’ll be meeting with doctors and school officials and whatnot to establish the next couple of months’ worth of care. Well, I couldn’t have been more wrong. The following is a little more detailed than it needs to be probably — but it was one of those days where all the details mattered — and we were left feeling like ping-pong balls bouncing around, so we might was well share a bit of that feeling. The morning starts off with the us at the clinic visit waiting to talk to the person who’d be giving us most of the “here’s the nitty gritty” about that aforementioned establishing. Only to hear that she’s not meeting with us today, she’ll see us Tuesday. Which really isn’t how you want to find out that your plans have been changed on you. At this point, we’re annoyed — yes, we knew it was possible, but not probable; yes, we signed on for this and were game for whatever; but we want to go home, and it seems like the reasons for keeping us here are for a couple of tenths of a point on a lab result that we can get just as reliably back in Idaho as we can here. 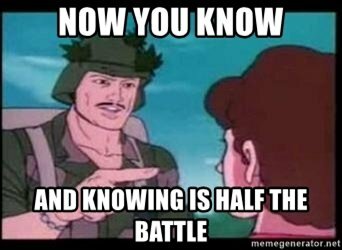 Then the nephrologist comes in and she’s prepared to send us home today, assuming the labs look like she think they will and she didn’t know that wasn’t in the cards. So she makes a call and tells us that we’re staying because everyone wanted to be sure that a pain Machen had last week had been resolved. It was news to the nephrologist that it hadn’t been — news to us, too. What pain? Don’t worry about it, it was such a minor blip, I didn’t even bother to mention it here (and I was more concerned about it than the surgeon). So, we’re back to maybe thinking (probably wishful thinking) that we might get the green light today. The nephrologist does her regular exam, tells us everything looks fantastic and starts typing her notes — at a couple of points, she stops and asks a question or two before carrying on. One of these questions, it turns out, was really important. She finishes her notes and tells us that she’d like us to get an ultrasound. To us, this seemed like something routine, and that it was one last thing we had to do before being sent off. Machen gets the ultrasound — it takes 30-ish minutes and is frankly a lot more interesting to watch, but far less emotionally gripping and nowhere near as fun to listen to, than one of a pre-born infant. We’re sent back down to the other end of the hall to wait for the nephrologist to send us back to the Ronald McDonald House (which I haven’t mentioned before, and I should fix soon) or home. After longer than we anticipated, the nephrologist comes out and asks if she can speak to us in one of the exam rooms. During the exam she’s heard something in the kidney, roughly equivalent to a heart murmur. I can’t remember the term she used, I think it starts with a “b.” Which, coupled with our answer earlier that he’d never had high blood pressure before the transplant, got her to order the ultrasound. Essentially — and she showed us a lot of ultrasound pictures to illustrate this, and then decided to draw something which was a lot clearer on the exam table paper — the blood is moving through the artery at a rate of 160 something per second, but then when it gets into the kidney it moves at 280-330 something per second. That increase in speed may indicate a restricted or obstructed blood vessel in the kidney. What this means, she’s not sure. What the next step is, she doesn’t know — testing, more imaging, who knows. How serious this is, she doesn’t know. She’ll talk to the surgeon and call us later. She stressed that the kidney is functioning fine, and actually the lab results from this morning’s draw were probably the best he’d had yet. There might be another tweak or two to the medication that we’ll be informed about this afternoon. Basically, we’re just supposed to go back to the RMH and not worry. Now, about this time, someone returned a voicemail I’d left on Monday — it was absolutely the right time and a very pleasant distraction. I’ll tell you about it in a day or two, when it’s a complete story. It’s going to be a fun one. Honestly, at this point, we’re not freaked out — the nephrologist has this incredibly calm and reassuring demeanor (she was the one who started calling the kidney beautiful). My wife and I are pretty sure that if it was any of the other doctors we’d dealt with here who’d said the exact same things she said, we’d be fretting, we’d be complaining that they hadn’t answered our questions more clearly or definitively. But somehow, she can get away with it. We’re not happy about the delay, but this is one of the things we’re staying around for — making sure that the kidney is fine and working okay. Yeah, we were grumbling when it seemed like a misunderstanding was keeping us here, but for this? No complaints — just wondering what our next step is. A couple of hours go by, and we get a phone call from the nephrologist. The surgeon and a different radiologist (one who spends more time looking at blood vessels, apparently) have decided that it’s not a concern at this time, and they see no need for further testing or imaging or anything as long as his blood pressure stays where it is. Nice little caveat, eh? She didn’t stress that part, but I’ve been ruminating on things for a bit. Oh yeah, and she made a tweak to the one medication getting the most fine tuning. Because, of course. Anyway, assuming every thing is pretty much the way it was when we left the clinic visit this morning on Tuesday, we should be headed home then. Since the day of the transplant — Machen has had many, many things explained to him through illustration. This is a smart way to do it — too often, I think he’s missed out on what various medical types have told him through the years because they just tell him things — sure they go out of their way to define terms, etc. But you can’t tell an 11 year old a bunch of medical truths and expect it to stick too well. Some of these illustrations have been helpful, others less so. Some have been best for kids younger than him (yet, those are super easy to remember). Some have even helped his mother and I grasp something better than we had before. But at clinic yesterday, we got one that was truly terrifying. We’ve been told for over a year that he’d have to drink a lot with the new kidney — the dietician even told him to start drinking 2 liters a day then so he’d be used to it. An adult kidney needs an adult amount of liquids a day to stay healthy, is essentially what he was told. At clinic, the Nurse Practitioner gave us a new illustration to explain why she wanted him to get 3L a day in. It’s like a plant, she said, when you water it regularly, it’s nice and green and grows. But if you forget, the leaves start to droop, it gets a little brown . . . but if you water it again, it gets back to green. But if you end up on a cycle like this, eventually, the leaves still droop a little, even with water. It doesn’t bounce back as green as it used to. And so forth. The kidney is like that, you keep it going with 3L in the heat, a little less during the rest of the year, and it’ll be fine. Forget that a few days, it’ll get worse, then bounce back, etc. just like a plant — eventually, this will hurt the kidney. Good illustration, easy to wrap your hands and brain around, etc. But here’s the problem — do you have any idea how many plants my wife and I have killed? The three non-grass plants in the front of our house have survived by sheer force of will (I think one of them might technically be a weed, but it’s big enough that it passes as a weak bush) — not because of our work. Every other plant we’ve come across is dead. We can’t take care of plants, we’re the equivalent of Jeffery Dahmer and Aileen Wuornos to plants. Shrubbery, evergreens, flowers, vines, flytraps, cacti, philodendron — you name it, we’ve killed it. If taking care of Machen’s kidney is the equivalent of taking care of a plant? He is so doomed. I’m just going to throw this out there, because sometimes people I’m related to worry that readers may not understand my sense of humor. The two paragraphs are me having a little fun with the illustration, just joking. Mostly, anyway. I mean, we are that horrible with plants. We have black thumbs, no hint of green at all. But kidneys aren’t shrubbery, or houseplants, or anything. We know that.